The Pomegranate fruit can be eaten out of hand by deeply scoring several times vertically and then breaking it apart. The clusters of juice sacs are then lifted out and eaten. The sacs make an attractive garnish when sprinkled on dishes. Pomegranate fruits are most often juiced. The sacs can be removed and put through a basket press or the juice can be extracted by reaming the halved fruits on an ordinary orange juice squeezer. Another approach starts with warming the fruit slightly and rolling it between the hands to soften the interior. A hole is then cut in the stem end which is placed on a glass to let the juice run out, squeezing the fruit from time to time to get all the juice. The juice can be used as a fresh juice to make jellies, sorbets or cold or hot sauces as well as to flavor cakes, baked apples, etc. Pomegranate syrup is also sold commercially as grenadine. Well the Grenade is named after this fruit it ranges in size from as small as a naval orange to the size of a ruby grapfruit. Leathery skin the seeds are white with the edible part around the seed being crimson red. When you bite into a seed the outer juice part will pop and most commonly you just chew up the tender seed. Cleaning: A great way to harvest all of the seeds if you're cooking for a party or commercial use is to break it up in water and have a strainer in the bottom. The "piff" (the white inside you don't eat) will float to the top, and the seeds will drop to the bottom. Pomegranates are great in just about everything you put them into. Salads, sauces or your mouth. 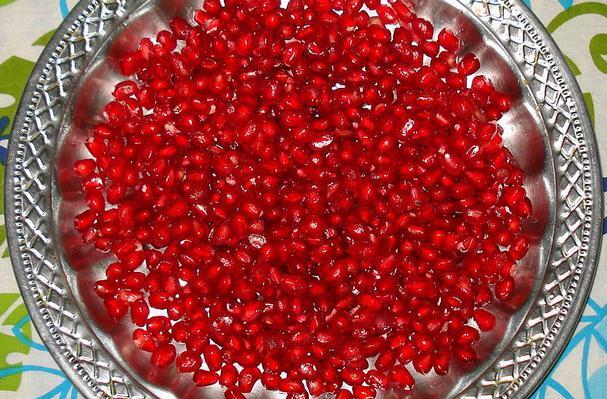 I love pomegranates! I had no idea that you could cook them to get all the seeds out--does it change the texture or taste of the seeds?